The traditional method of PIV catheter insertion requires knowledge of vascular anatomy for estimation of the location of the target vessel and requires visualization or palpation of the vessel for accurate puncture. Location of vessels can vary considerably because of anatomic variability. Veins can be distorted as a result of scarring from previous cannulation attempts or sclerosis. Veins are difficult to palpate in patients who are obese or edematous. Patients with difficult access are routinely subjected to multiple insertion attempts by different operators and are at increased risk of complications. In addition to increased discomfort, such patients often have their blood draw and laboratory test results delayed. When the traditional approach fails, the alternative means of gaining intravenous access are blind placement of a PIV catheter, generally in the deep brachial vein; placement of an external jugular (EJ) catheter; or insertion of a central venous catheter (CVC). Each of these options has its own disadvantages. The external jugular vein is not visible in all patients. Patients often cannot tolerate the Trendelenburg positioning used to place EJ catheters. While CVCs provide additional information and are necessary in many situations, they have a higher complication rate than PIV catheters (eg, pneumothorax, deep vein thrombosis). CVCs should be used when clinically indicated or when alternative options have been attempted unsuccessfully. Studies have shown that ultrasound-guided PIV catheter placement results in higher overall and first-pass success rates and very low complication rates. No contraindications exist to ultrasound-guided peripheral intravenous (PIV) catheter placement. Lidocaine 1-2% with or without epinephrine may be used at the site of insertion, as in traditional peripheral catheterization. Since ultrasound-guided PIV placement is usually of short duration and associated with limited discomfort, local infiltration is often not necessary. For more information, see Local Anesthetic Agents, Infiltrative Administration. In pediatric patients, depending on the urgency of placement, a topical anesthetic cream (eg, eutectic mixture of local anesthetics [EMLA]; lidocaine, epinephrine, and tetracaine [LET]) can be applied. These agents require as long as 30 minutes to take effect. For more information, see Anesthesia, Topical. When local anesthetic infiltration is used with traditional peripheral intravenous (PIV) cannulation, the swelling that results from the infiltration can make the target vein difficult to see or palpate. This is not a problem under ultrasonographic guidance. This is the probe of choice, favored by most practitioners. This probe has a flat footprint and results in an image on the screen that is rectangular or square (ie, linear scanning format). See the image below. Linear probes are high-frequency probes (7.5 to 10 MHz) and produce high-resolution images of superficial structures. This probe has a large, curved footprint and is usually used to scan deeper, larger structures such as in the abdomen or thorax. See the image below. Typically has a frequency range of 2-5 MHz. When using this probe to place PIVs, select the higher frequency (the frequency can be manipulated on most ultrasound machines). The higher the frequency, the greater the resolution but the lower the penetration. For vascular imaging, a higher resolution (ie, 5 MHz) should be selected. Compression of vessels (to identify veins) may be more difficult with a curvilinear probe than with a flat linear array transducer. This curvilinear probe has a tight footprint and is designed to be inserted into an orifice for closer proximity to the organ of interest. If a linear probe is not available for vascular access, this probe is a practical alternative given its small footprint and high frequency. It has a wide field of view (up to 180º) and has a frequency range of 8-13 MHz. These higher frequencies produce images with improved resolution at the expense of depth of penetration. Standard versus longer (1.88 to 2.5 in) catheters. To incorporate a guidewire and a catheter, first complete venipuncture with a needle. Then, place the guidewire into the lumen of the vein, position the catheter over the guidewire, and remove the needle. 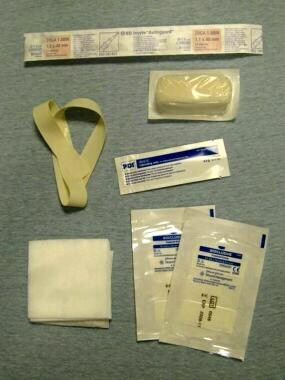 A 1.75-inch catheter is commonly used with this technique. Packaged water-based lubricant gel, such as that used for digital rectal and vaginal examinations, is sterile and is the preferred choice during ultrasound-guided PIV catheter placement. 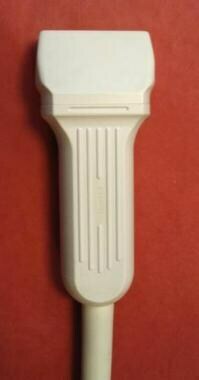 The ultrasound gel used for regular brightness mode scanning (in large plastic bottles) is not sterile and may have bacterial contaminants. An assistant is helpful but not required. Ultrasound-guided PIV catheter placement can easily be performed, and is perhaps even best performed, by a single operator. The patient may be sitting or supine. Both the patient and operator should be comfortable. Practitioners often prefer to be seated at the bedside. When cannulating upper-extremity veins, the arm should be abducted and externally rotated to fully expose the anteromedial aspect. Preferred and alternate machine placement are shown below. Ultrasound-guided PIV cannulation can be performed in 3 simple steps: (1) survey of venous anatomy with ultrasound, (2) preparation, and (3) needle insertion and manipulation under ultrasonographic guidance. These steps are easily performed by a single operator and involve a combination of short-axis (transverse) and long axis approaches. To survey the vessels, start in the antecubital fossa. Slide the transducer up and down the humerus. Start by positioning the transducer over the antecubital fossa in the transverse orientation, with the probe indicator pointing to the patient's right side. Another, simpler rule regarding probe orientation is to keep the probe marker directed to the operator's left. In this orientation, the probe marker corresponds to the left side of the image seen on the ultrasound screen. While surveying the venous anatomy, fully compress the vessels to differentiate veins from arteries. Patent peripheral veins easily and completely collapse when gentle pressure is applied with the transducer. In contrast, arteries do not completely collapse, though slight deformation of artery walls can be seen. Arteries can often be seen pulsating. Color-flow Doppler and pulsed-wave spectral Doppler can both help identify veins and differentiate them from arteries, as in the images below. Basilic vein; brachial vein and artery. Drag the transducer up and down the target vein to better determine the direction and depth in which it travels. 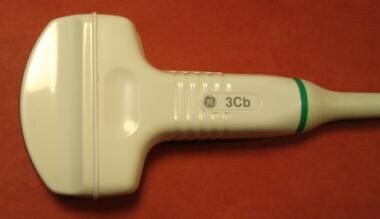 Place a cover (eg, Tegaderm) directly on to the probe face without any gel between them, as shown below. This protects the transducer from the preparatory solution or bodily fluids and maintains a sterile insertion site. Apply a tourniquet high up around the arm near the axilla. Prepare the arm from the antecubital fossa to the proximal humerus. 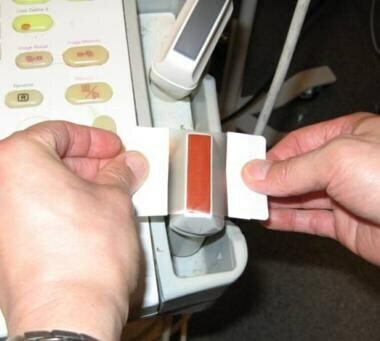 Apply sterile gel to the transducer and the arm, as shown below. Preparing to place an intravenous line. 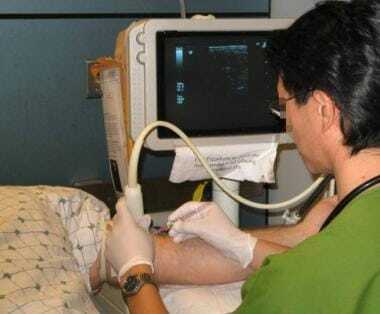 Hold the needle with the dominant hand and hold the ultrasound probe with the nondominant hand. Center the vessel on the ultrasound screen; the center of the probe corresponds to the center of the display monitor. Before puncturing the skin, slide the catheter between the transducer and the skin to look for the shadow artifact, as shown below. Align the shadow artifact with the vein on the ultrasound screen. 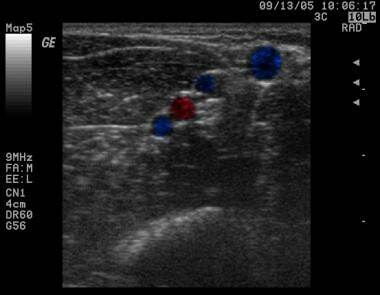 Take note of the depth of the chosen vein by using the depth markers on the side of the ultrasound screen. Use a needle approach angle of 45 degrees perpendicular to the skin, as shown below. By using this approach angle, the point of skin insertion should be the same distance in front of the transducer as the depth of the vein. After initial needle puncture, identify the needle tip on ultrasound by scanning back and forth just beyond the point of needle insertion. Failing to locate the needle tip can lead to misdirection and difficulty assessing the proximity of the needle tip to the target vessel. 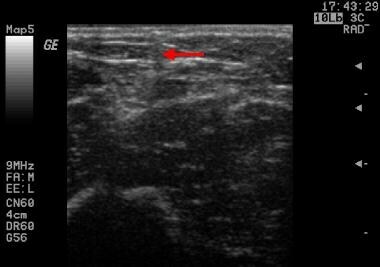 When advancing the needle, focus on the ultrasound screen and not on the probe or skin surface. Repeated adjustments of the course of the needle are crucial to successful cannulation of peripheral veins. Confirm cannulation of the vein with flashback of blood or with direct visualization of the needle tip within the lumen of the vessel (ie, bull's eye sign). Put down the transducer and continue with placement of the PIV catheter as per the usual technique. Draw blood and then flush the catheter. Wipe gel off the arm. Not advancing the probe while advancing the needle (see the video below). Common mistake - Not moving probe and tracking needle. Not tracking the needle and locating the needle tip (see the video below). Failing to locate the needle tip results in puncturing through the back wall and overshooting the vessel. To avoid falling behind the needle tip as shown below, move the probe ahead of the needle, then advance the needle until it enters the ultrasound beam and comes into view on the screen. Common mistake - Moving probe too slowly and overshooting vessel. Because of the smaller size and increased anatomic variability of peripheral vessels, ultrasound-guided PIV placement is best performed in real time. With central line placement, however, the operator has the option of locating and marking the vessels with ultrasound first, and then performing the cannulation in the traditional manner. Although ultrasound-guided PIV cannulation can be performed by a team of 2 people, the authors recommend a single operator. Considerable coordination is required between 2 people if one of them controls the transducer and the other moves the needle. The transverse approach, shown below, has advantages and disadvantages. The advantage of the transverse approach is better lateral resolution, which results in a higher success rate. The main disadvantage is the challenge of not losing sight of the needle tip. In this approach, the operator must move the probe forward along with the needle tip as it is advanced. The longitudinal approach, shown below, also has advantages and disadvantages. The advantage of the longitudinal approach is that the entire needle can be visualized as it advances and enters the vein. The depth orientation is better with this approach. For some operators, this approach is also more intuitive. The disadvantage of the longitudinal approach is poor lateral resolution. A needle located just to the side of a vessel can be appear to be in the same plane. In addition, operators must be careful not to accidentally rotate off the vein and onto an adjacent artery as they obtain the longitudinal view. PIV catheters often become infiltrated or dislodged. 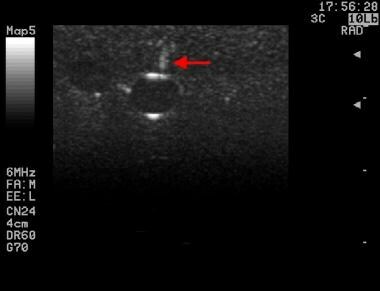 In one of the earlier reports of ultrasound-guided PIV insertion, Keyes et al concluded that the technique was safe, rapid, and highly successful. They also noted that 8% of the catheters infiltrated or fell out within 1 hour after placement, despite the use of relatively long catheters (1.8 to 2.0 in). They surmised that the rate of infiltration may have been caused by the proximity of the intravenous site to the biceps muscle and tendon, the securing of the intravenous tubing across the antecubital fossa, and the greater depth of the veins in larger patients. Their conclusion was that longer-than-normal catheters should be used for this procedure. Longer PIV catheters (2.5 in) are commercially available. They do, however, present their own challenges. Flash-back is delayed with longer catheters, and many practitioners find them somewhat harder to control. 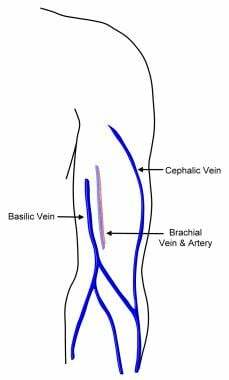 First, under ultrasonographic guidance, the deep brachial or basilic vein is cannulated with a catheter of standard length (32 mm). A guidewire is then passed through the catheter into the vein. The initial catheter is then removed, and a 15-cm, 16-gauge catheter is inserted over the wire into the vein. Using this 2-step process, Mills et al reported a success rate of 92%, with an infiltration rate of 4%. The median time to complete the procedure was 8 minutes. The catheters remained in place a median time of 26 hours. Patients demonstrated a high degree of satisfaction. The authors concluded that this technique offers a safe and rapid alternative to central line placement in adult patients with difficult intravenous access in the emergency department setting. A midline catheter is a variation of a peripherally inserted central venous catheter (PICC line). A PICC is usually 50 cm or longer, inserted into an arm vein, and advanced until the tip is located in the superior vena cava. These catheters are used in inpatient and outpatient settings when long-term intravenous access is needed. Placement of a PICC line is an involved procedure that often takes an hour or more to complete. If the procedure is performed in a radiology suite, fluoroscopy can be used for guidance. In addition, the position of the catheter must be confirmed with radiology before use. For these reasons, PICC lines are not placed in emergency departments and other acute care settings. For more information on the role of interventional radiology in the placement of venous access devices, please see Central Venous Access in eMedicine’s Radiology journal. Midlines extend approximately to the level of the patient's shoulder and are much faster and easier to insert than PICC lines. They combine the best characteristics of traditional peripheral and central venous catheters. See videos below for the Step Method. To avoid catheter dislodgement and infiltration, use longer angiocatheter needles (1.88 to 2.5 in). Use great care when cannulating the wall of the vein, as they are prone to buckle, and the needle may puncture through both the anterior and posterior walls. Passing the needle into the vein typically results in flashback. If, after the plastic catheter is advanced, no return of blood appears, then the vein has likely been overshot (ie, the needle has punctured the posterior wall). Scan distally or rotate the probe into the longitudinal approach to determine if the needle tip has passed beyond the vessel. When this occurs, try attaching a saline-filled syringe to the catheter and, with gentle aspiration, slowly withdraw the catheter tip until venous blood is obtained. Once blood is seen, slowly advance the catheter again. If the needle appears to be in the vessel but no flash or return of blood has occurred, release forward pressure on the needle and see if the needle still appears to be in the vein. If the needle tip is above the vein, advance the needle and look for the vein to pop open. After feeling the pop of the needle passing through the vein wall, look for flashback and for the bull's eye sign. Before flushing the catheter at the end of placement, remember to release the tourniquet. Otherwise, the vein might rupture. Be mindful of the amount of pressure applied to the transducer. 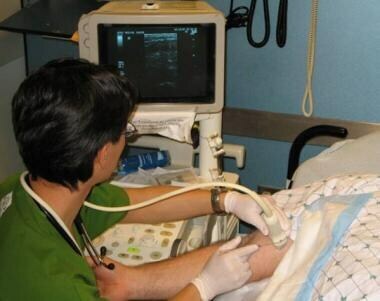 Peripheral veins collapse easily and, when collapsed, cannot be visualized on the monitor. The catheters used are long, so the flash may take a few seconds to appear. Be careful not to keep advancing the needle while waiting for flashback, as doing so results in overshooting the vessel. On the monitor, watch the needle enter the vessel and then stop advancing. Wait a few seconds and look for subsequent blood flash to confirm that the needle is truly in the vessel. To avoid problems with probe orientation, always keep the marker on the probe pointing toward the operator's left. If the needle tip is lost, try gently wiggling or bouncing it back and forth in the tissue to find it. See below. Bouncing the needle to help find the tip when it is not visible on the monitor. Arterial puncture (brachial): Arterial puncture can be avoided by distinguishing vein from artery through compression or use of color flow Doppler and pulsed-wave spectral Doppler. It can be further avoided by not cannulating the deep brachial vein when other options, such as the cephalic or basilic veins, exist. Shokoohi H, Boniface K, McCarthy M, et al. Ultrasound-Guided Peripheral Intravenous Access Program IsAssociated With a Marked Reduction in Central Venous CatheterUse in Noncritically Ill EmergencyDepartment Patients. Ann Emerg Med. February 2013. 61:198-203. [Medline]. [Full Text]. Au AK, Rotte MJ, Grzybowski RJ, Ku BS, Fields JM. Decrease in central venous catheter placement due to use of ultrasound guidance for peripheral intravenous catheters. Am J Emerg Med. 2012 Nov. 30(9):1950-4. [Medline]. Kramer DA, Staten-McCormick M, Freeman SB. Percutaneous brachial vein catheterization: An alternative site for intravenous access. Ann Emerg Med. 1983. 12:247. Keyes LE, Frazee BW, Snoey ER, Simon BC, Christy D. Ultrasound-guided brachial and basilic vein cannulation in emergency department patients with difficult intravenous access. Ann Emerg Med. 1999 Dec. 34(6):711-4. [Medline]. Costantino TG, Parikh AK, Satz WA, Fojtik JP. Ultrasonography-guided peripheral intravenous access versus traditional approaches in patients with difficult intravenous access. Ann Emerg Med. 2005 Nov. 46(5):456-61. [Medline]. Weiner SG, Sarff AR, Esener DE, Shroff SD, Budhram GR, Switkowski KM, et al. Single-operator Ultrasound-guided Intravenous Line Placement by Emergency Nurses Reduces the Need for Physician Intervention in Patients with Difficult-to-establish Intravenous Access. J Emerg Med. 2012 Oct 25. epub ahead of print:[Medline]. Miles G, Salcedo A, Spear D. Implementation of a successful registered nurse peripheral ultrasound-guided intravenous catheter program in an emergency department. J Emerg Nurs. 2012 Jul. 38(4):353-6. [Medline]. [Full Text]. Ma OJ, Mateer JR, Blaivas M. Vascular Access. Sydor AM, Boyle PJ, eds. Emergency Ultrasound. 2nd ed. China: McGraw-Hill; 2008. Chapter 19. Elia F, Ferrari G, Molino P, Converso M, De Filippi G, Milan A, et al. Standard-length catheters vs long catheters in ultrasound-guided peripheral vein cannulation. Am J Emerg Med. 2012 Jun. 30(5):712-6. [Medline]. [Full Text]. Stone BA. Ultrasound guidance for peripheral venous access: a simplified seldinger technique. Anesthesiology. 2007 Jan. 106(1):195. [Medline]. Meyer P, Cronier P, Rousseau H, Vicaut E, Choukroun G, Chergui K, et al. Difficult peripheral venous access: clinical evaluation of a catheter inserted with the Seldinger method under ultrasound guidance. J Crit Care. 2014 Oct. 29(5):823-7. [Medline]. Fields JM, Dean AJ, Todman RW, Au AK, Anderson KL, Ku BS, et al. The effect of vessel depth, diameter, and location on ultrasound-guided peripheral intravenous catheter longevity. Am J Emerg Med. 2012 Sep. 30(7):1134-40. [Medline]. Witting MD, Schenkel SM, Lawner BJ, Euerle BD. Effects of vein width and depth on ultrasound-guided peripheral intravenous success rates. J Emerg Med. 2010 Jul. 39(1):70-5. [Medline]. Blaivas M, Brannam L, Fernandez E. Short-axis versus long-axis approaches for teaching ultrasound-guided vascular access on a new inanimate model. Acad Emerg Med. 2003 Dec. 10(12):1307-11. [Medline]. Mahler SA, Wang H, Lester C, Skinner J, Arnold TC, Conrad SA. Short- vs long-axis approach to ultrasound-guided peripheral intravenous access: a prospective randomized study. Am J Emerg Med. 2011 Nov. 29(9):1194-7. [Medline]. [Full Text]. Sandhu NP, Sidhu DS. Mid-arm approach to basilic and cephalic vein cannulation using ultrasound guidance. Br J Anaesth. 2004 Aug. 93(2):292-4. [Medline]. Mills CN, Liebmann O, Stone MB, Frazee BW. Ultrasonographically guided insertion of a 15-cm catheter into the deep brachial or basilic vein in patients with difficult intravenous access. Ann Emerg Med. 2007 Jul. 50(1):68-72. [Medline]. Cosby KS, Kendall JL. Emergent Procedures. DeStefano F, Dernoski A, eds. Practical Guide to Emergency Ultrasound. Philadelphia, PA: Lippincott Williams & Wilkins; 2006. 297-302. Resnick JR, Cydulka R, Jones R. Comparison of two transducers for ultrasound-guided vascular access in long axis. J Emerg Med. 2007 Oct. 33(3):273-6. [Medline]. The authors would like to thank Linda J. Kesselring, MS, ELS, for her invaluable work in copyediting the manuscript and incorporating our revisions into the final document.